Wei TaeWoong¡?s opponents are from Ukraine, Sauth Africa, Hong Kong in the first day and Taiwan, China and America in the second day. 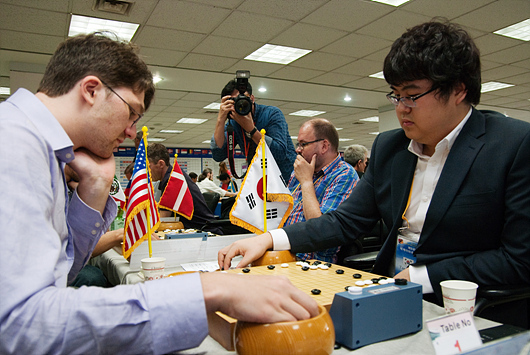 The key game was the game against Hu YuChing from China in the 5th match. In this game, Hu YuChing from China led the game by little from the beginning, but Wei TanWoong tried his last move and succeeded in turning the game for him. Wei TaeWoong said in the interview that I couldn¡?t see his games before the match, and just reviewed few games with others. I felt unprepared about him but thought I should do my best; I could win the game with a lot of lucks. I am very happy to win the KPMC, and I will prepare with my best for next year¡?s pro qualification tournaments. China came up second and Taiwan, Japan, America, Mexico, Taiwan and Russia followed after that.